Go to Gyft.com and open a new account. Validate your e-mail address by checking your e-mail and clicking on the link inside. Check your Gyft Wallet and you should see a $5 Gytf promo code ($15 minimum purchase required). Copy the $5 Gyft code. (Optional) You can try to stack the 3% cash back from shopping portal TopCashBack, or if you don’t have an account you could try to earn the sign-up bonuses from eBates ($10 new customer bonus) or Mr. Rebates ($5 bonus). On Gyft, add a $15 Amazon gift card to your cart. When checking out, if possible pick Google Wallet as your payment method (for $5 Toys R Us promo card). 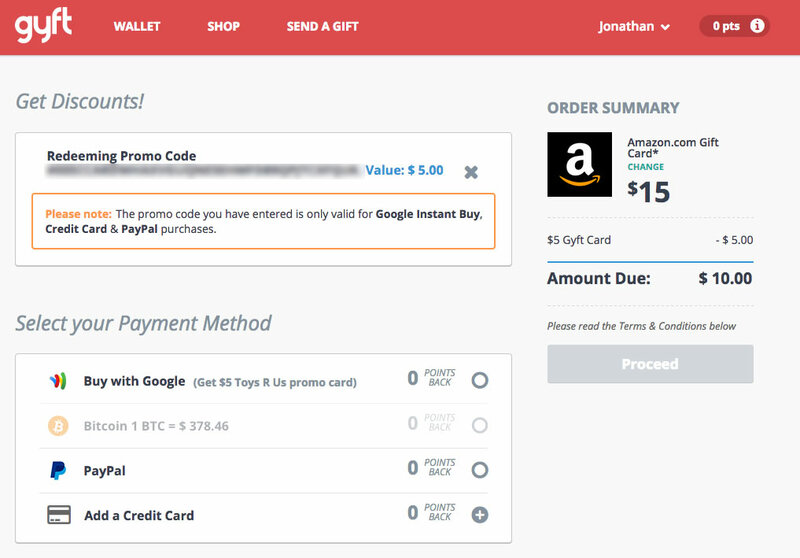 Link whatever rewards credit card you like to Google Wallet, and make the $10 purchase. Now start a new purchase. 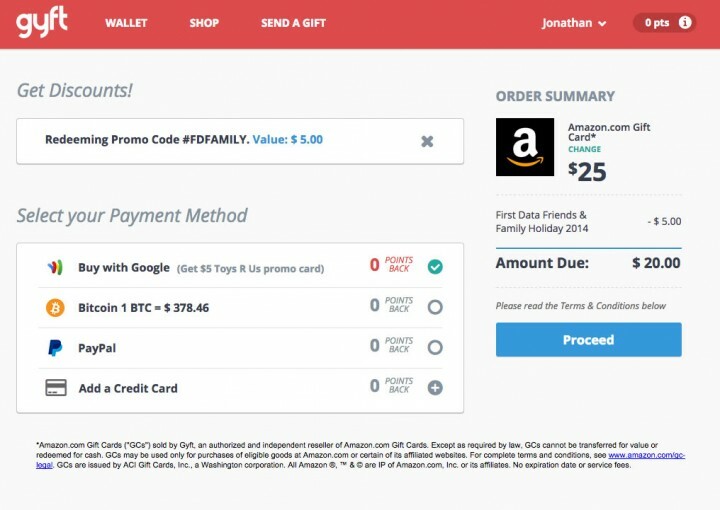 Add another $25 Amazon gift card to your cart, and apply the promo code FDFAMILY (for $5 off $25 purchase). You must pay with a method other than Google Wallet, so just pick PayPal or credit card. Make the $20 purchase. Now you’ll have charged $30 on your credit card, and you’ll have $40 in Amazon gift cards that you can use immediately. Plus a $5 Toys R Us gift code. I did my purchases little differently back when you could stack the two promos, but the result was the same. Only took about 5 minutes, and I have already applied the codes to my Amazon account. Credit to FW and SD. Perhaps someone else has a way, but I was only able to see my $5 Toys R Us gift card (also works at Babies R Us) via the Google Wallet mobile app on Android or iOS. The code works in-store as well as online.